Bossa Studio and Curve Studio have confirmed that they are indeed working on a PS Vita and PS3 version of "Thomas Was Alone" the original game was released on PC and Mac July 2012 however the PS Vita and PS3 versions will arrive sometime this Spring. Thanks to "HassanJamal" for the tip. 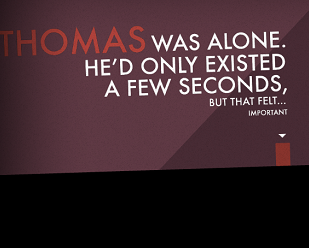 Let us know what you think of Thomas Was Alone in the comments below!